How do you get people to do things they normally wouldn’t? Or even excel at things that are difficult? Simple. You turn it into a game. Called gamification, the approach has existed for a while, long before there was even a term coined for it. You know how Mom used to tell the kids that the first one to finish their broccoli could pick the bedtime story? And that recent trip to Maui the spouse earned for selling the most in her territory? Yeah, those are sort of like analog-style, “proto”-gamification examples. In modern terms, gamification refers to game mechanics being used to influence human behavior, especially as it relates to things like applications and websites. But in the real world, it’s showing up in a variety of settings. The military, for example, is gamifying its training process, quite literally using combat game applications. Smartphone apps, video and computer games, virtual worlds — all of these are being developed and deployed, not only to attract and engage younger candidates, but also to prepare them for combat. Gamification also has some use in the business world. 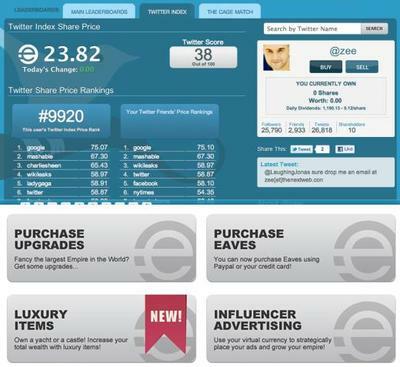 Empire Avenue is a new site that’s getting some attention lately, since it encourages users to “buy and sell people” (like stocks) in the social media space. Normally, trying to gauge online social influence is a tough proposition, but this company is going an innovative route in developing an actual market for this using a game architecture. There are badges that can be unlocked, and the whole experience of investing in people is a neat and novel concept. What will probably further encourage “players” is that, as the service learns more about you, it can recommend people to you, as well as introduce you to others with similar tastes. That’s what users get out of this. What the business world may wind up with is a more accurate idea of who the real tastemakers and opinion leaders are online. And that is invaluable. 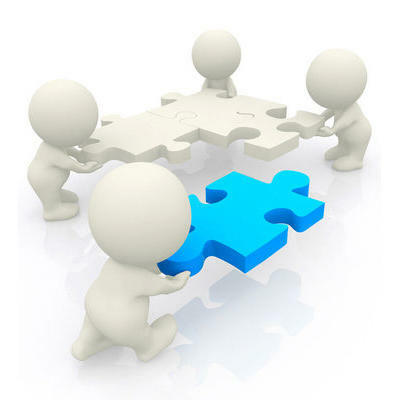 But the benefits of gamification are not limited to military use and corporate research. Everyday users can get something out of this as well. Say you want to encourage people to eat healthier. Well, you could talk at them until they’re bored to death. Or nag them, until they half-heartedly ditch the potato chips (for now). But if you turn it into a game, you might actually stand a chance of shaping their behavior. That’s exactly what Foodzy seeks to do. 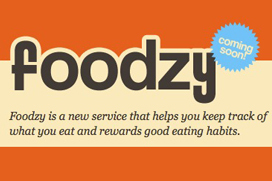 In an era when people find dieting as enjoyable as doing their taxes, along comes the Foodzy app to turn the chore into a fun activity. There are points and badges awarded for healthy food choices, and the app has even made dieting more social, by letting users share what they’re eating virtually with other users. It also allows crowd-sourcing food entries in the database. The app just had its 500-user beta launch last weekend at The Next Web Conference in Amsterdam, but it’s not hard to think of where this could go next. Imagine a Foodzy API that allows for integration with weight scales, the Kinect or sports apps and accessories (think Nike Plus). All of that allows for real-time measurement, goals and scoring according to the actual progress of the individual “gamer.” Long-term plans for Foodzy span all of this and more. It will be very interesting to see if or how this takes off. So what have we learned? Well, for one, badges seem to be key. And two, the social aspect works hand in hand with this. But really, maybe it’s that people are hardwired for gaming, and we’re only scratching the surface of where that can take us. Could you imagine what would happen if people got badges for paying credit card bills on time and sticking to their household budgets? Heck, maybe we could actually solve this economic crisis. Er … well, maybe not. But if the Home Budgeting game was half as popular as Angry Birds or Foursquare, a lot more households would be on the right track. What would you gamify, if you could? School? Work? Relationships? Tell us your most genius (or craziest) concepts below.